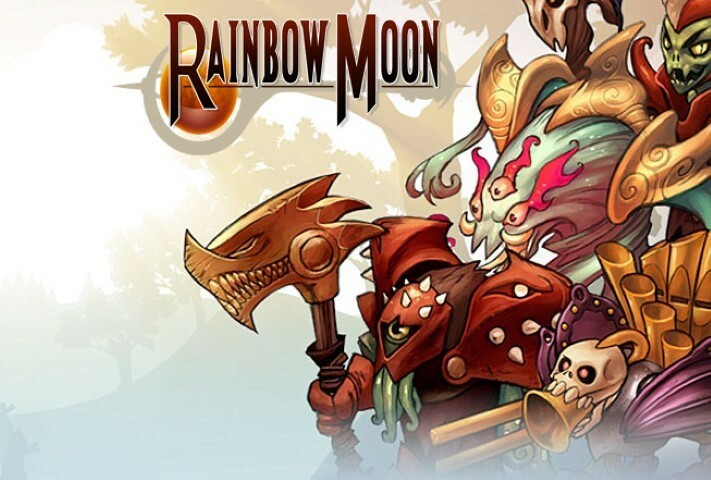 Rainbow Moon PS3 Review. Overall, I was very surprised with how much fun Rainbow Moon was and would highly recommend any fans of RPGs to buy the game. If you have fifteen dollars you will find there is no better way to spend your money, if you don’t I’d recommend saving up to buy this game. 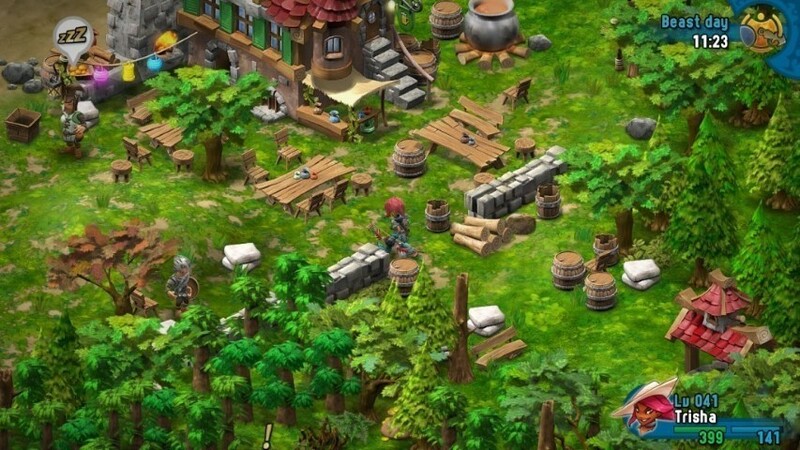 Rainbow Moon is a strategy-rpg game exclusive to the Playstation Network that can be purchased for fifteen dollars. While I am a fan of strategy games, I probably wouldn’t have thought to look at it had I not been asked to review the game. That would have been a huge mistake on my end as the game surprised me with how entertaining and enjoyable it was. The game starts off rather slow and combat begins rather repetitive until you start learning skills and get new abilities. The first hour of the game is as such rather basic and is not a good reflection of the game. The more you play, the better the game gets as you slowly get more units, more turns, better gear, extra attack abilities, and more that all help add to the strategy aspect. The game is very long and very filled due to countless side-quest, a long story, a big world, and more. The storyline of the game is rather lackluster, and it is clear the game puts more emphasis on gameplay than story. While normally this would bother me, in this game I was so distracted with the gameplay that the very basic storyline was hardly noticeable. It starts off with a short little explanation of how your character got knocked through a portal and warped to another world and that monsters were also warped to this world. As such your character has to figure out how to get home. The story is simple and mostly gets split up to things like sending you to talk to one person, but then you need to gather certain supplies to get to him, and then he needs to be rescued from some enemy, and so on. Basically it comes up with various excuses to send you around the world and play. However, that is really all the story needs in this world and with such an entertaining system. As I mentioned, the gameplay is very enjoyable due to various mechanics. 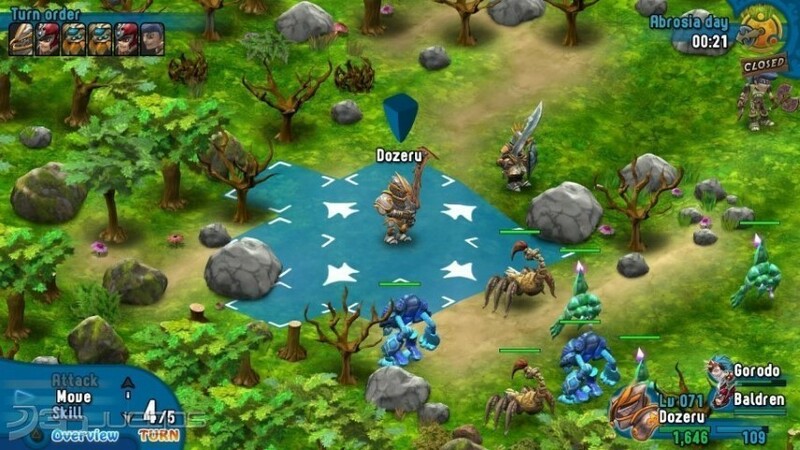 While it is technically a strategy-RPG, it’s more an RPG element than a strategy game. The strategy element of the game stems from the battle system where each fight will warp you to a small tile based system where enemies will move around and you can move around and throw attacks. Normal RPG elements exist such as attack, skills, items, defend, and such, but you also have the ability to move around on the tiles to achieve good positioning to help you fight. This small element of strategy adds a fun and enjoyable mechanic that blends nicely with the game thus requiring strategy, but more on a small scale rather than a large scale. Speaking of combat, there are two main ways to get into combat, the first is running into enemies on the map, similar to Chrono Trigger, which will send you into battle with those enemies and upon their death will clear up the way. For those that want to level more than that or need to grind there is also a random battle option, but the random battles are not forced on you. Instead when a random battle triggers you will see it appear on the bottom of the screen and it will ask you to ‘press X’ if you wish to engage in this fight. This allows a player to explore the world without interruptions or engage in a battle if they feel like doing that. It’s a nicely done system that allows people to explore a dungeon without being constantly sucked into a fight while allowing those that want to kill more enemies to do so on their terms. The element of choice is necessary due to the strategy mechanics of the game as it would be frustrating to have to engage in strategy battles every couple steps in a dungeon. 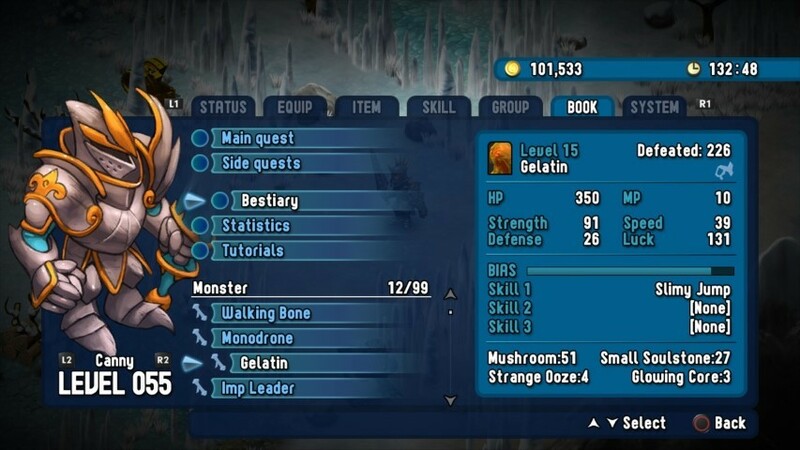 In addition to the well-developed combat system, Rainbow Moon has a very fun and engaging customization system which allows a player to pick what stats they upgrade, add stats to their weapons, and make their character play how they want. When you kill things in battle, the character that landed the killing blow is awarded a form of currency called ‘Rainbow Pearls.’ These pearls can be spent at a special vendor that allows a person to pick what stats they upgrade. Various stats exist that help the player achieve whatever they want. Tanks can upgrade defense, attack will cause more damage, speed will allow you to have more turns, MP allows more skill use, and more. Each time you level up the maximum stat goes up and each enemy you kill gives you currency to spend on upgrading your stats. In addition to the rainbow pearls, a normal form of currency exist that allows you to buy items, skills, weapons, and normal RPG supplies. The two currencies are nicely balanced and very simple to understand. The game does have a few small hiccups and while I don’t feel they don’t detract from the game I still feel the need to mention. As I stated earlier the game starts off rather slow. Early on in the game when you have one turn and no skills fights consist of spending your turn to move or attack and not both. This means the beginning of a fight is the enemy and yourself slowly walking towards each other and then doing one basic attack. It can be boring early on, but as you slowly get stronger and stronger they get more complex and fun. The other downside is the inclusion of a ‘food system’. On your characters status bar there will be a hunger meter and you occasionally have to open up the menu and select a food item to keep that bar full. While it goes down slowly, it adds nothing to the game and can be slightly annoying at times having to remember to keep stocked up on food and to use it. Overall, I was very surprised with how much fun Rainbow Moon was and would highly recommend any fans of RPGs to buy the game. If you have fifteen dollars you will find there is no better way to spend your money, if you don’t I’d recommend saving up to buy this game. Normally games on the PSN are small mini-games, but Rainbow Moon is a long, full, and well-done RPG for an amazingly great price. There are retail games that go for the full sixty dollars that aren’t as nicely designed or give as much entertainment as Rainbow Moon. This is one game that will be staying on my PS3 for quite some time and I’m extremely grateful that the game was brought to my attention or I would have missed an amazing jewel of a game.